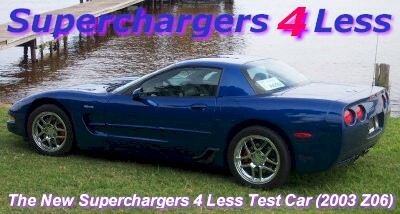 "Go Here" to see and hear our Procharger P-1SC-1! 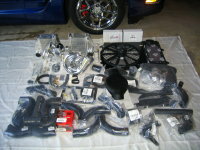 We hope that the following photos, advise, tips and instructions will help anyone installing or thinking about installing an ATI Procharger HO Intercooled system on a C5 Corvette. If you have high speed internet service, "Go Here" to see the installation manual that Procharger provided with our system. 1. System received and inspected. Everything looks good and is accounted for. "Go here for a larger view"
2. Pinning the harmonic balancer to the Crankshaft. The harmonic balancer on the LS1 engine is not keyed to the crankshaft, so it must be pinned to keep it from shifting with the added torque load of the supercharger. ATI and Vortech both supply the tools to accomplish this task. Getting to the area that we need to work on is not so easy though. On a C5 Corvette the steering rack sits directly in front of the crankshaft bolt that retains the harmonic balancer. We jacked up the car and removed both front wheels. With a 18mm socket on an air impact wrench we removed the nuts that hold the tie rod ends to the spindles, no problems so far. We unbolted the power steering cooler from the cross member and tied it up and out of the way with a piece of wire. We then removed the bolts holding the steering rack and the traction control unit. 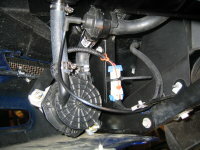 The traction control unit was easily raised and tied out of the way. 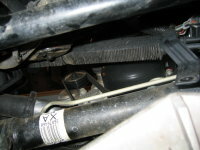 The steering rack would not go up high enough to allow access to the crankshaft bolt. We pushed the rack toward the driver side of the car (rotating the steering wheel to the right seemed to help), we were then able to raise the passenger side of the rack high enough to allow us to get a break over handle and 24mm socket onto the bolt. We found that a piece of a 2 by 4 was perfect to hold the steering rack up and out of the way. The bolt that holds the harmonic balancer on, has a locking compound on it. The engine will spin while trying to loosen the bolt. We stopped this from happening by sticking a screw driver through one of the vent holes in the back of the bell housing and into the teeth of the flywheel. We removed the factory front bolt and then installed the provided ATI drill guide/alignment tool onto the end of the crankshaft. Clearance between the radiator and drilling area is very tight, so we used a flexible drill attachment (see picture above) on our drill to give us more room to work. We also wrapped our drill bit with tape at the pre-measured depth that ATI recommended, to give us a stopping point for our drilling depth. We checked the depth of the pin hole before we tapped the pin into place, it would be a real problem if we tapped the pin into a hole that was a millimeter to shallow. We cleaned the old thread locking compound off of the original crankshaft bolt and reapplied LockTite® The original bolt was then reinstalled, torqued to 40lbs and then turned another 120 degrees. 3. 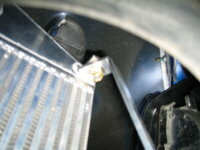 Relocating the air pump was fairly simple and is required to make room for the driver side intercooler. 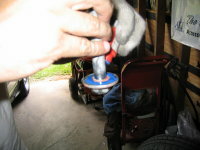 The relocation moves the air pump further forward. We removed the front air dam and panel behind it on the driver side of the car. 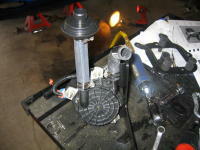 The factory air pump assembly was removed and modified as instructed in the owners manual. We reinstalled the modified pump assembly onto the new ATI supplied bracket. Our set of instructions called for rubber isolator bushings, which were not supplied. We contacted ATI about the bushings and found out that they are no longer on the packing list... cannot hear any noise, must be fine without them. (Tech support was to make note of this discrepancy) The finished assembly mounted back onto the car using two of the three original threaded bolt holes. 4. 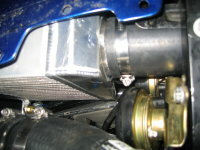 Relocation of the horns is required on the passenger side to make room for the other intercooler. We straightened out the tab that holds the horns in their original position and rotated them as the manual instructed. This still did not give us the clearance we needed. We had to rotate one of the horns on it's bracket and bend the bracket toward the radiator to get the clearance required. 5. 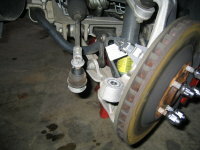 Mounting of the Intercoolers: The intercoolers mount to the frame of the car with two bolts each. 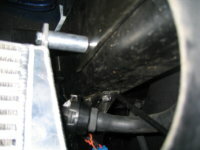 The ATI supplied longer bolts, brackets and stand offs are shown above. We found that it was easier to tighten the bolt in "fig 1" from above by opening the head lights and reaching it from the top. 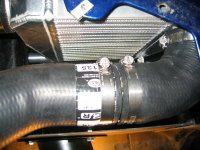 The bracket to intercooler bolt "fig 2" was easier to reach from the bottom.